The Digital Library of Appalachia provides online access to archival and historical materials related to the culture of the southern and central Appalachian region. 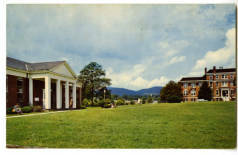 The contents of the DLA are drawn from special collections of Appalachian College Association member libraries. Collections are organized by the college, and by subjects such as music, literature, or daily life and customs. The collections accommodate written material, audio material, and photos. Brevard College participates in the North Carolina Digital Heritage Center. The North Carolina Digital Heritage Center is a statewide digitization and digital publishing program housed in the North Carolina Collection at the University of North Carolina at Chapel Hill. The Digital Heritage Center works with cultural heritage institutions across North Carolina to digitize and publish historical materials online. The Digital Heritage Center provides libraries, archives, museums, historical societies, and other cultural heritage institutions with the opportunity to promote and increase access to their collections through digitization. The Center is supported by the State Library of North Carolina with funds from the Institute of Museum and Library Services under the provisions of the Library Services and Technology Act, and by the UNC-Chapel Hill University Library.